Apron kitchen sinks are also known as farmhouse sinks and they were quite popular in olden days in country side homes. Apron kitchen sinks add a very rural and rustic feel to the kitchen, almost resembling the simple and crude look of 19th and 20th century countryside kitchens. The depth of apron kitchen sinks is generally more than that of other sinks available in market. In olden days, the countryside families were large and the long depth helped in accommodating large pans, pots or just numerous dishes. Today, though the usual family size in cities is just about 3-5 members, the elegance and rustic feel of apron kitchen sinks is here to stay. So whether you have a small or a large family, if you like countryside or farmhouse look for your kitchen then apron kitchen sinks are the best option. Apron kitchen sinks are called so because the front side of such sinks is slightly raised above the counter and is slightly fitted towards the outside from the cabinet below. In olden days, it prevented dripping of water into the wooden cabinet below. So it acts like an apron i.e. prevents water spillage onto the counter and the cabinet beneath. Today apron kitchen sinks are available in single and double bowl capacities. Not just that, they are available in various materials like stainless steel, copper, stone, porcelain, fireclay etc. and an array of colors and designs. Stainless steel apron front kitchen sinks are light in weight, affordable, durable and tough. A stainless steel sink would go with any décor. So if you are confused about the material and cost of apron sinks, just go for a stainless steel apron front kitchen sink – it is affordable, easy to maintain, elegant and long lasting too. They are available in single and double bowl capacities. Apron front farmhouse kitchen sinks are great for large kitchens with enough space to lend for such kind of sinks. You can be carefree about the toppling load of pots, pans or dishes with such deep sinks. Even the faucet arrangement can be placed a little higher as water will fall into a greater depth than regular sinks and will not splash out; and at the same time allow more space (between the faucet and sink) for you to comfortably wash dishes. White apron front kitchen sinks give a very pure and clean look to your kitchen (although they require additional maintenance). White apron front kitchen sinks are more susceptible to stains from foods. Hence it is best to keep them clean at all times. They are available in porcelain and fireclay. Those made from fireclay would be resistant to scratches, are tough for heavy duty cleaning, are resistant to abrasions from chemicals and are very easy to maintain. Whether you opt for a stainless steel or a white apron front kitchen sink, be sure you have a large space to accommodate apron sinks. Also, it may be a little difficult for you to stand for a long time (while washing utensils), considering the depth that you have to access every now and then (especially if the sink is placed too low for your height). So place it in accordance with your height and flexibility of accessing the deep sink. Installation of such sinks should be done carefully, as they may be heavier as compared to other sinks. 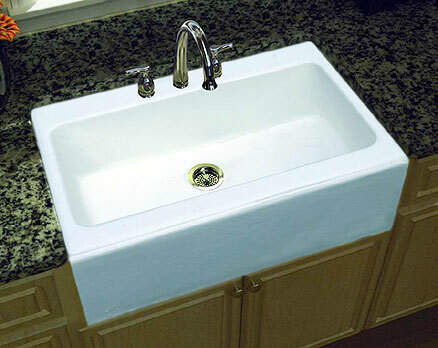 And of course, affordability and durability are factors you can’t ignore while choosing an apron kitchen sink. There is certainly a very classic feel about an apron kitchen sink but choose it according to your needs, ease of maintenance and space. Style and décor can be managed with some other accessories, but functionality should always come first. Click here for the best deals on apron kitchen sinks. Among the well-known manufacturers of apron sinks are Kohler, Franke, Lenova, Belle Foret and Kraus.